Ty Dillon, driver of the No. 3 Bass Pro Shops/Tracker Boats Chevrolet, celebrates with his girlfriend Haley Carey in victory lane after Dillon won the NASCAR Camping World Truck Series Jeff Foxworthy's Grit Chips 200 at Atlanta Motor Speedway on Aug. 31, 2012 in Hampton, Ga. Third-generation NASCAR driver Ty Dillon took to Twitter Saturday night to announce his biggest news to date, his engagement to girlfriend Haley Carey. Once Dillon made the announcement, the congratulatory tweets flowed in from fellow drivers and NASCAR personalitites. 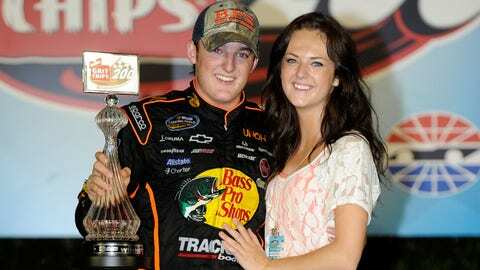 @tydillon @HaleyKCarey congrats you guys ! Dillon is the latest NASCAR driver to pop the question, joining the likes of Joey Logano and Clint Bowyer. Just don’t look for Dale Earnhardt Jr. or Ricky Stenhouse Jr. to follow suit any time soon.